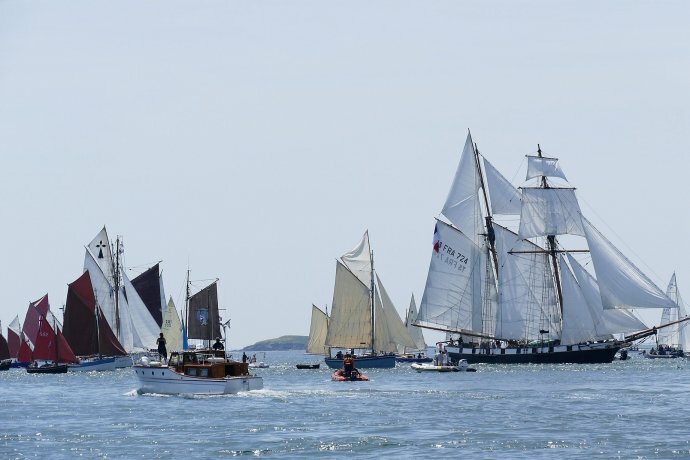 La Semaine du Golfe du Morbihan is a maritime and international event, a cultural and popular festival, in the magical framework of the Mor Bihan (“Little Sea”). More than 1,000 traditional and character boats, divided up into coherent and identifiable flotillas, sailing every day and stopping in various ports and anchor points. The result: a “bursting” maritime festival, bringing alive the whole of the Golfe of Morbihan. The festival gathers boats of every size and every maritime tradition, with more than ten nations represented in 2015. The programme is designed by sailors for sailors. Semaine du Golfe offers all the ingredients of a popular fete, attracting a very large public. Attendees will enjoy exhibitions and demonstrations under cover or in the open-air; food specialities including oysters, grilled and smoked fish, and “Breton products;” music of all kinds (street-bands, jazz, Celtic music, choirs, folk, shanties…); and evening entertainments and performances (concerts, “festou-noz”—traditional Breton Dance— as well as popular dances and fireworks.